India will be bolstered by the return of striker Robin Singh after a long injury layoff, in Stephen Constantine's regular 4-2-3-1 formation. Phnom Penh: Preparing for the AFC Asian Cup Qualifiers, the Indian football team will get a chance to assess their strengths and weaknesses in a match situation when they play Cambodia in an international friendly here on Wednesday. This is India's first friendly since the 4-1 rout of Puerto Rico on home soil in September, 2016. Both the teams will approach the game with seriousness, as it is their last competitive outing before kicking off their respective qualifying campaigns for the AFC Asian Cup in 2019. 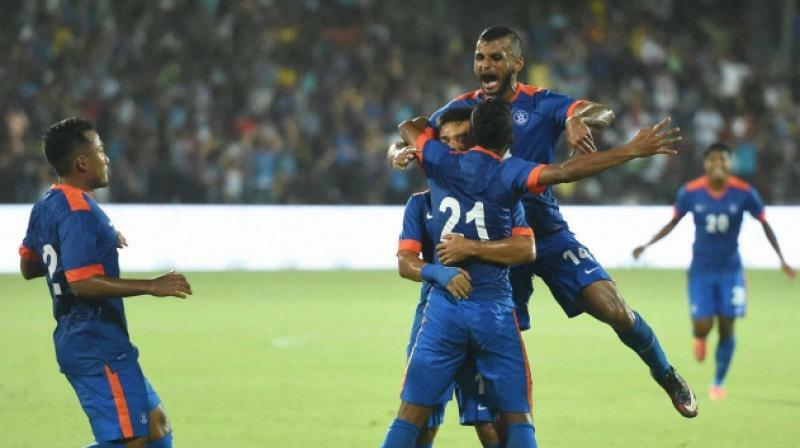 India are slated to begin their campaign in the AFC Asian Cup Qualifiers against Myanmar in Yangon. For the record, the last time India emerged victorious in an away international friendly was way back in 2006, when the team captained by present team manager Shanmugam Venkatesh eked out a solitary goal win over Pakistan. It will be an opportunity for coach Stephen Constantine to provide a platform to the youngsters such as Jerry Larlinzuala, Milan Singh, Nishu Kumar and Daniel Lalhlimpuia to make a mark in the international arena. With Arnab Mondal and Sandesh Jhingan's season dogged by injuries and poor form, it could be an opportunity for Anas Edathodika to finally make his international debut. India will be bolstered by the return of striker Robin Singh after a long injury layoff and, in Constantine's regular 4-2-3-1 formation, the tall striker is set to play upfront in the company of the talismanic Sunil Chhetri. India's last meeting with Cambodia, at the 2007 Nehru Cup in New Delhi, ended in one of their biggest-ever wins in international football – a 6-0 demolition of the southeast Asian nation. Constantine was not amused to see an artificial turf at the National Stadium. "We will be playing on an artificial turf. We would have preferred to play on grass. But we need to adjust. It is a very important match for us ahead of the crucial match against Myanmar in the AFC (Asian) Cup Qualifiers. I thank AIFF for arranging the same," the Briton said. "There are 4-5 players who are carrying slight niggles, so I haven't yet decided on the starting XI. Let me see what suits us best. "The weather conditions in Phnom Penh are quite similar to that in Yangon and it will be a good test for us," he said. Goalkeeper Gurpreet Singh Sandhu will be leading the side on Wednesday, his second consecutive match as the national team captain, after India's big win over Puerto Rico. The Indian squad of 24 arrived here after a camp in Mumbai. "You need international games to develop as a team and the AIFF has confirmed international friendlies until October which is very positive. The more you play the more team chemistry you develop and the more the players gel," said the coach. "There is a very healthy competition to get into the starting XI. It is a huge honour to get selected for India and the players understand that. The philosophy in the team says there is no guarantee for anyone and you need to work hard to stay in the squad and work harder to get into the starting XI," added Constantine.